The U.S. Congress has passed a bill allowing the Environmental Protection Agency to establish a grant program dedicated to Columbia River cleanup work. On Dec. 9, Oregon's Senators Jeff Merkley and Ron Wyden, and legislators Earl Blumenauer, Suzanne Bonamici and Peter DeFazio announced that the Columbia River Restoration Act passed in the House and the Senate as part of the larger Water Resources Development Act. The legislation will now be sent to the president's desk to be signed into law. "Nobody wants to worry that the water they are drinking or fishing in or swimming in is tainted, but 8 million inhabitants of the Columbia River Basin have had their health, safety and environment endangered by toxins in the river. Now Congress is finally doing something about it," Merkley said. "This bill will provide a much needed boost to the health and economy of our beloved Columbia River." The Columbia River is the largest river in the Pacific Northwest. Its 1,243 miles extend into seven states. About 8 million people inhabit the river basin, including members of several tribal nations and angling groups who fish its waters. "Pacific Northwesterners count on the Columbia River as a vital economic resource and environmental treasure," Wyden said. "Preserving and protecting the river is a must to ensure the river remains the clean and healthy lifeblood of our region." Blumenauer called the act's passage "a significant win for our efforts to reduce pollution and improve the water quality of the Columbia River." The legislation would authorize the Environmental Protection Agency (EPA) to establish a voluntary, competitive Columbia Basin grants program for projects that assist in eliminating or reducing pollution, cleaning up contaminated sites, improving water quality, monitoring the basin, and promoting citizen engagement. 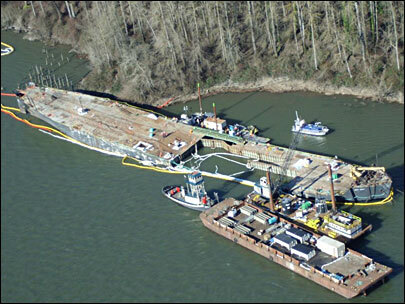 "The Columbia River is a powerful economic force in Oregon," Bonamici said. "The river carries goods to market, serves as a valuable source of energy, and provides salmon to tribal populations and others. We must reduce pollution and contamination of this critical resource." The Columbia River Restoration Act is supported by a diverse group of stakeholders including the Lower Columbia Estuary Partnership, Columbia River Inter-Tribal Fish Commission, Pacific Northwest Waterways Association, and Salmon-Safe. Congress Passes "Columbia River Restoration Act"